As speeds increase and filling-line machinery becomes more sophisticated, both operators and management teams require improved visualisation and control information to ensure efficient plant operation. The good news is that current-generation supervisory control and data acquisition (SCADA) solutions have all the answers, regardless of your job role. Filling and bottling are fundamental steps in most automated process plants producing liquid products. The medium could be free-flowing or viscous, stable or volatile, heated or chilled, foodstuff, pharmaceutical, chemical or lubricant – packed in volumes from a few millilitres to many litres. In all cases the process is essentially the same and integrates similar steps, including aligning the filling head with the receptacle, dispensing a measured amount of fluid, capping or sealing, labelling and palletising. Significantly, a typical filling line will have several dispensing heads, all working simultaneously, multiplying the number of functions that need to be synchronised and controlled. Furthermore, most filling operations are performed at high speed, yet need to dispense precise amounts of product while not spilling a drop. To complicate the matter further, alarms will have to be monitored and data will have to be collected and processed in real time if production targets and schedules are to be met. Therefore a filling station requires a control system is that is high speed, accurate, can communicate with other machine controllers and feed information up to an overall production control system. The control system also needs to be adaptable, because it is a fact of manufacturing life that requirements will change on a regular basis. The best control solution for a filling line is likely to be based on a SCADA system. This can collect and process data from field devices, HMIs (human machine interfaces) and local controllers, such as PLCs (programmable logic controllers). It interprets the data and can adjust machine settings as necessary to optimise or re-optimise production. It can also activate alarms and initiate appropriate actions if required. See image above. 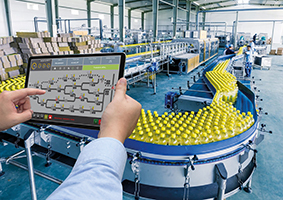 SCADA can also be integrated with a plant-wide control system or an enterprise management system to provide a seamless ‘shop floor to boardroom’ information and control system that allows production to be constantly monitored and adjusted – to increase throughput, change product or packaging, for instance. Finally, SCADA can log all data for review, analysis, track-and-trace. Given all this capability, you might expect SCADA to be expensive, and indeed it can be – especially if restrictive user licences are applied. However, some suppliers, such as Products4Automation, are committed to reducing the costs of SCADA while expanding its availability to an ever-widening range of users. Its Movicon SCADA platforms have been developed so that there is no need to develop expensive bespoke code for each new application. Movicon is based on XML and Windows, including web and cloud services technologies, so is fully open and flexible. This creates an all-in-one development environment for managing SCADA, HMI, statistical production data analysis and report generation. Movicon is infinitely scalable, easily adaptable and quickly extendable so that it can evolve and meet changing user needs. It integrates with hardware, software, complementary systems and advanced technologies such as 3D graphics, animation, augmented reality and the industrial internet of things (IIoT). In a filling or bottling application Movicon collects information to monitor operations and check alarms, taking readings in real-time and calculating OEE (overall equipment effectiveness) and efficiency KPIs. This information is stored in a database and, where appropriate, shared with other devices, plant and control system via Ethernet or fieldbus connections. Movicon can display this information, often as simple graphics, on appropriate display screens and compare it with information from other systems, such as incoming orders and raw materials availability. It can also produce reports for all authorised parties from machine operatives to company directors. In short, Movicon can be used to develop high-performance, real-time production control systems for bottling plants that are simple and elegant, yet highly effective and easily adaptable to future changes, at a price that until a few years ago was inconceivable.